Rajon Rondo’s Dallas Mavericks debut wasn’t all that we expected from a perspective of wishing to see how he would fit in the team’s half-court offense. The league’s resident grump Gregg Popovich threw out plenty of “DNP’s – Rest” to only have eight active players (hypothetically, ten as Splitter and Green were on the bench in their warm-ups) and had his guys in zone defense for the majority of the game, a rare sight in the NBA. The game wasn’t as big of a anticlimax as one could imagine though as San Antonio’s zone put Dallas in a position to make some interesting half-time adjustments. I’ve already previously expressed how NBA zone defenses are a pet peeve of mine, breaking down the time Hornets used it against Boston. To shortly recap, the players seemingly aren’t used to being in one and there is a weird emphasis on guarding the space you’re supposedly responsible for, no matter how far away from the action or an opponent you might be. With San Antonio going to it whole game long, one could assume that they were prepared to use it last night and thus that’s why they did a rather good job at it. Announcing teams tend to over-use this narrative but, going into the half-time break, it did indeed feel like the Mavericks weren’t supposed to be only 5 points down, having faced a 10-point deficit and their poor shooting leading to bad results against the Spurs zone. Dallas was more successful in the second half though as it provided some fun examples on how Rick Carlisle and Rajon Rondo could possibly get together and make this Mavericks team work, a possibility thrown out there by many NBA writers based on the high IQs these both basketball minds have. Rondo obviously is a difficult player to have out there against zone defenses as he allows them to do what they exactly are designed for – force three-point shots. Carlisle compounded that factor with another Mavericks first half problem, their lack of penetration and unsuccessful swinging of the ball around the perimeter, and corrected it with one move as he stationed Rondo on the foul line. 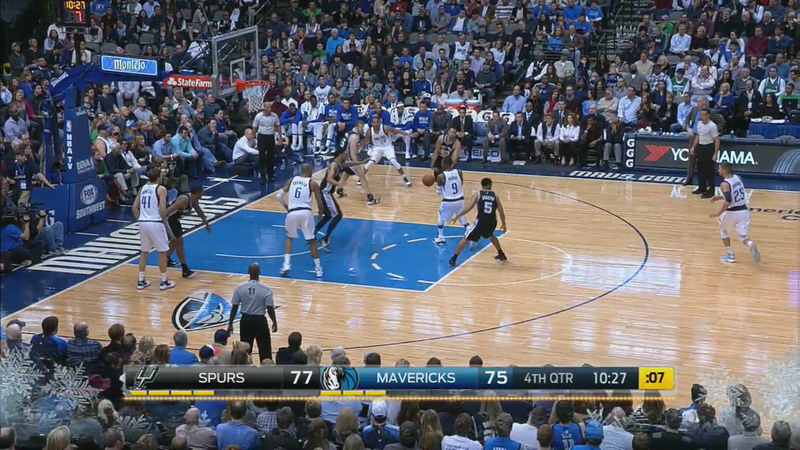 That half-circle is generally the place for which offenses will look for when facing the zone. A big can make a cut towards it, catch the ball and break down the defense with a pass, being able to hit any area of the floor and having attracted extra attention away from guys guarding out-side shooters. For a capable passer like Rondo it was the perfect role. It’s simple, it’s fun, it uses Rondo to his best abilities and it forced plenty of defensive breakdowns. 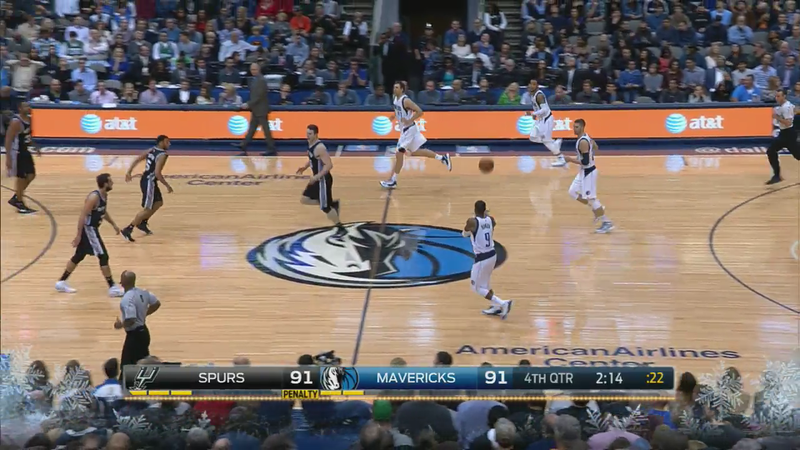 While Dallas’s coaching staff had installed that wrinkle for Rondo, it also prepared some half-time Monta-centered adjustments. 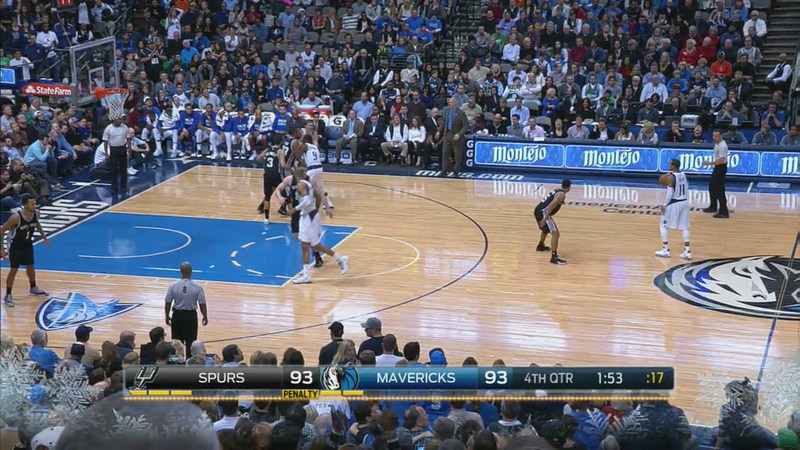 They had their team crossing the half-court line with Monta off the ball and then swinging the rock to his side of the court for him to attack the basket through that slight opening full head of steam. It seemed like an obvious encouragement made to Ellis to attack the basket more often and not have the team settle for outside looks. It was a game with unique set of circumstances so it’s impossible to draw any conclusions about the new-look Mavs (as it would have been anyway after only one game). Besides the plays highlighted above, it also featured Carlisle using 12 of his players, even Ricky Ledo and Charlie Villanueva getting some burn before getting bounced after only playing about 2 minutes. It also displayed Dallas’s inability to rebound off their own glass which could get worse with Brandan Wright shipped to Boston. The Spurs, a bottom-10 team in offensive rebounding percentage and a team that mostly abandons the offensive glass, yet can get some second chances based on their size, grabbed 30.8% of the possible offensive rebounds, good for the league’s best mark (while Dallas finished with an equivalent of the league’s worst, them already being 29th in this category), against a Mavericks team that played Richard Jefferson and Chandler Parsons at the 4 and only tried out Greg Smith for 10 minutes. However, as you could see it did prove to provide some examples of how Rick Carlisle and Rondo can make certain situations work. 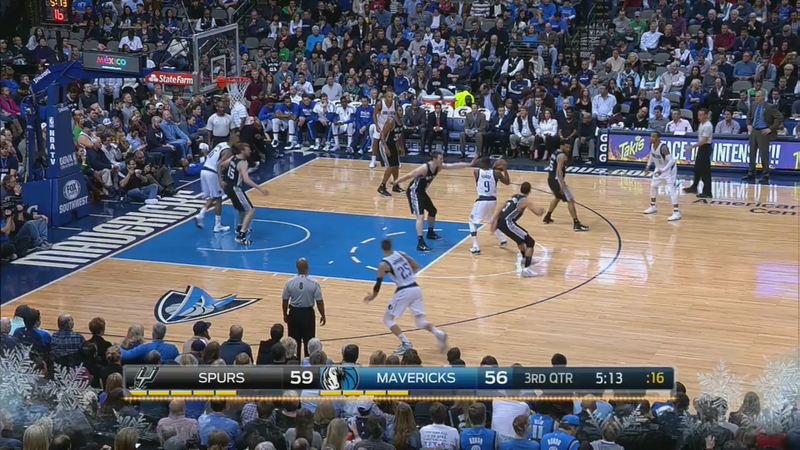 It will be entertaining to monitor the situation and continue watching the Mavericks play. This entry was posted on December 21, 2014 by ReinisLacis in Around the NBA and tagged Dallas Mavericks, Monta Ellis, Rajon Rondo, Zone Defense.